SE-02, Analog Synth Rack/Sound Module from Roland in the Boutique series. ROLAND’s SE-02 is a mono analog synth resulting from the collaboration between ROLAND and STUDIO ELECTRONICS. It is a kind of SE-01 (a rack inspired by Studio Electronics’s Minimoog) in Roland’s “boutique” format. The size was much debated: it is indeed very small and could disturb – say – owners of a JU-06! But what is lost as to ergonomics is won again in terms of transportation ease. As a whole, building quality is good but the select switches don’t look that reliable, perhaps I’m wrong but as a consequence they’re not pleasant to tweak. Otherwise, the other switches are OK.
As to the audio inputs/outputs, they’re in the minijack format – not jack: while there’s no tragedy here, it’s still a bit of a pity as on the long run it risks being less sturdy and to cause more contact problems. 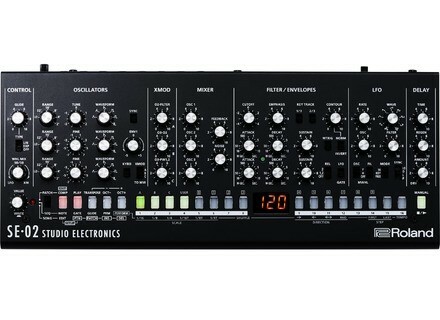 Please also note that the SE-02 is Roland’s only Boutique not to run on batteries. However, it features a real power supply socket (there’s a USB plug too, but it’s not used to supply the synth). Well, it’s conversely proportional to the instrument’s size – it’s huge! Its sound grain is very close to that of a Minimoog, much more to me than the recent Moog models* and many modern synths, which oscillators sound too sterile. All the opposite with the SE-02’s sound which vibrates like that of a vintage Moog - its leads will make you shiver, and the bass lines will just hit you in the guts! The sound is huge, fat, rough (or sweet, at taste)... for such a price, it’s hard to believe! So, is the SE-02 a smaller Minimoog clone? Well, it’s not, but it’s strongly inspired by it and in the end, adding the memory, delay, sequencer and far superior synthesis features, it is actually way more powerful: no need to stay within the range of Moog-types bass/leads, especially with the pwn, the (real) LFO and the xmod feature. However, the interface and look are far less pleasant than a Minimoog’s, and these aspects also matter when you tweak or play an instrument. 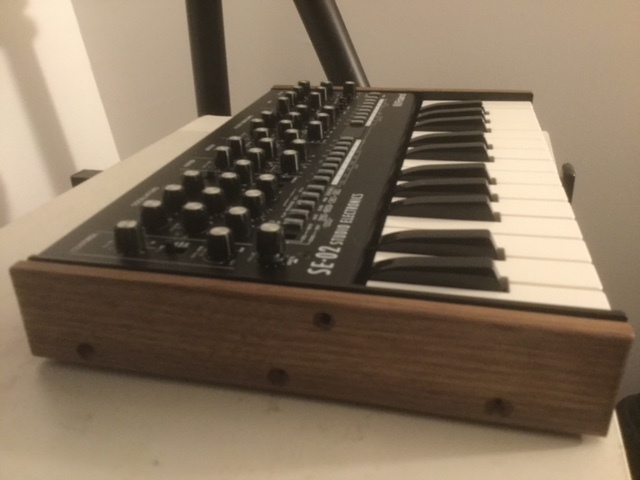 This is why I opted for adding the small K-25m keyboard to complement it (it’s finally quite playable in mono) and to add it wooden (walnut) sides: how cute! (see pics below) I ordered them through mixingtable.com . Yet, while the keyboard can easily be transposed using the SE-02’s transpose keys, it’s a real pity that the k-25m features neither a pitch bend nor a wheel. Also, the product’s lifetime (likely to be much lesser than a Minimoog’s) is to be taken into account. This is great, as for 600€ (approximately 6 times less than a reissue), you are as close as it gets to a Minimoog’s sound, closer at least than with any other recent synth (Behringer has announced a “real” Mini clone for soon which shall be even less expensive, but so far it’s hard to tell whether it will sound as good or not). What a great time we’re living for analog synths! However, I have the feeling that it won’t last beyond a few years as the market is already almost saturated (especially regarding mono models), but let’s take advantage of it while it lasts! 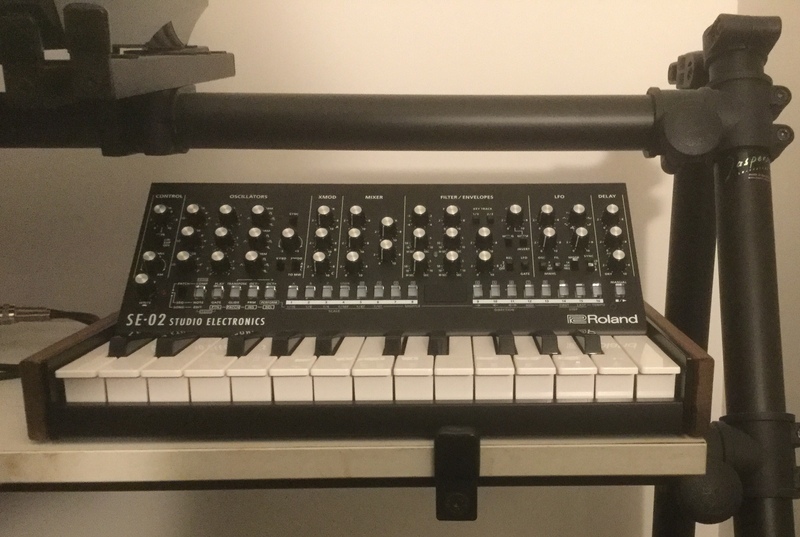 The Roland SE-02 is perfect for those after the Minimoog sound (and even more), however they’ll have to try it first to check if its size is not a problem for them. 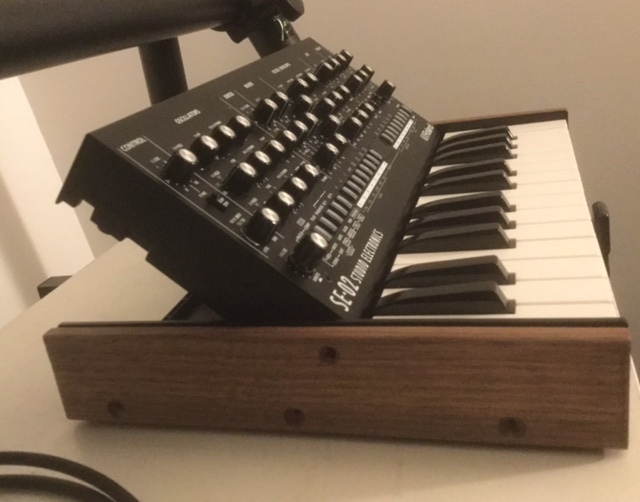 As far as I’m concerned, after one month owning this "miniminiminimoog", I’m still amazed by the sound that gets out of it everytime I set it on, plus it perfectly complements my other four analog synths (Sequential Prophet 6, MFB dominion 1, Dreadbox Erebus and Analogue Solutions Nyborg-24), especially for its sounds in the (very) low end and the rough soundgrains for which it surpasses my old Moog Sub phatty and Vermona mono Lancet. 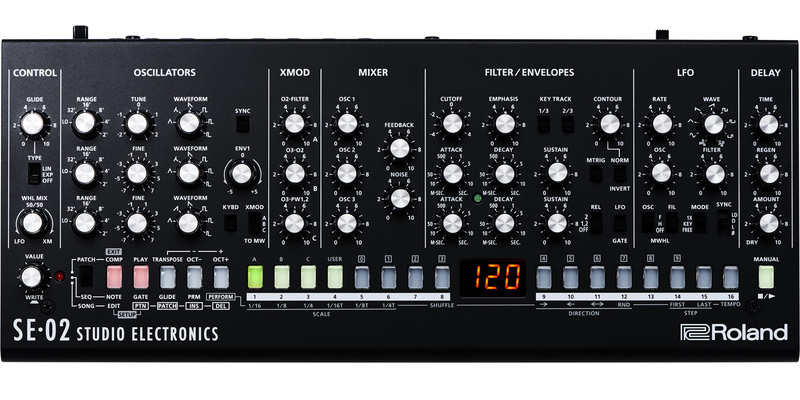 PS : According to SE’s website, it seems that the SE-02 would only be the beginning of the collaboration between Studio Electronics and Roland: hopefully, they’ll release a 5-6 voices poly version under the 2000€mark!